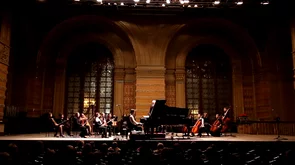 «October» written by Calvin Jones, arranged by R.J. Miller performed in concert in Odessa, Ukraine with the Odessa Philharmonic, Igor Shavruk conducting. One of many soulful selections from this concert event, «October» is a modern classic picturing the changing leaves and gray skies of autumn. From Paramount: The Symphony Sessions release.